Passes for this weekend’s 40th Anniversary Mountainfilm Festival are sold out. But for those who failed to score a pass: don’t despair. The four-day festival features a plethora of free events that range from outdoor movies to parties, archival films, gallery walks, intimate talks, book fairs and more. In fact, one could easily have a rich and jam-packed festival experience without going to a single ticketed event. 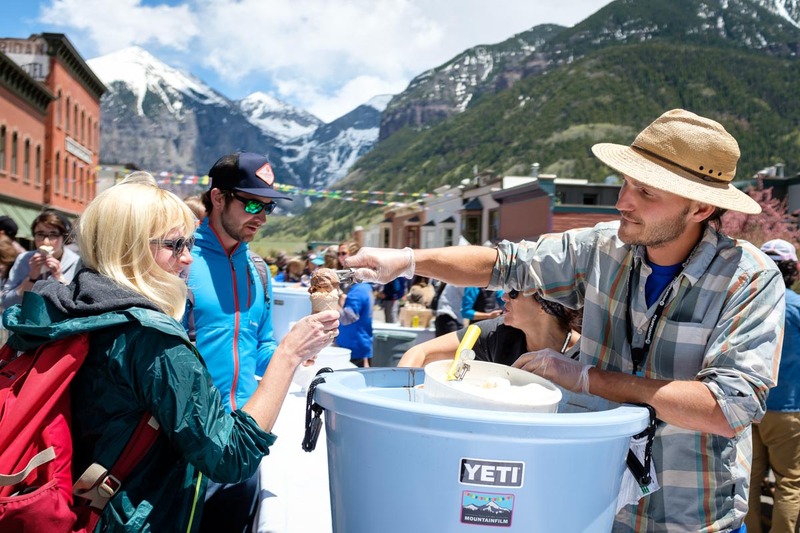 Festival Director Suzan Beraza says the free events are Mountainfilm’s way of thanking the community that has given so much to the festival over its 40-year history. Free events kick off Wednesday with the annual Mountainfilm-themed edition of Twenty(by)Telluride at 7 p.m. at the historic Sheridan Bar. 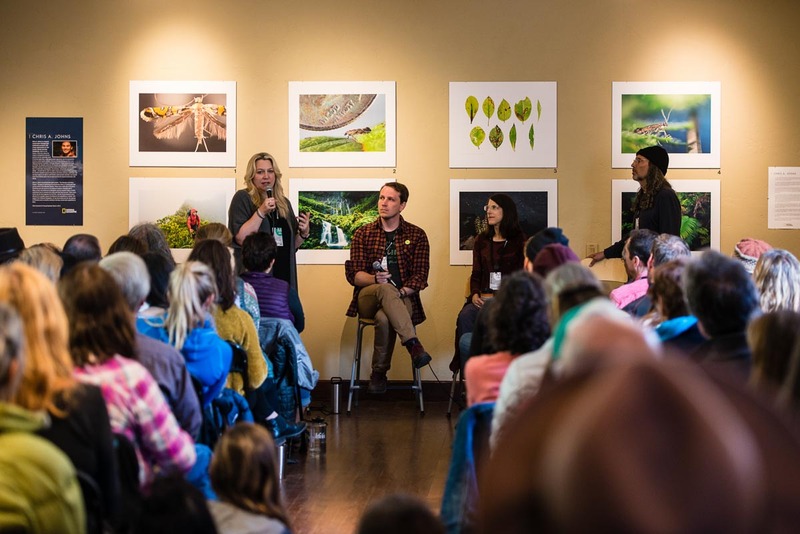 This event — a collaboration with Telluride Arts — brings five creatives to the stage to tell their stories, 20 slides at a time (with just 20 seconds per slide). This year’s presenters include former festival director Arlene Burns, 2018 poster artist Joseph Toney, filmmaker Tyler Wilkinson-Ray, film producer and writer Anna Brones and Norwood-based British climber Adrian Burgess. That will be followed by the first of five nights of free movies at Base Camp, the state-of-the-art outdoor theater in Town Park. Kicking off the Base Camp lineup is a screening of Scrapple, the cult classic 1998 ski bum movie that was filmed in Telluride by brothers Geoff and Chris Hanson. The Base Camp lineup also include the ski film Numinous on Thursday; the Jane Goodall biography Jane on Friday; the always-popular Adrenaline program on Saturday and the adventure epic Return to Mount Kennedy on Sunday. All films begin at 8:45 p.m.; the audience is encouraged to bring warm layers and low-backed chairs. Then once Friday hits, the free events will be everywhere you turn: there’s the Friday Gallery Walk through downtown venues; Saturday’s Ice Cream Social on Colorado Avenue; Booze & Banters with guests like Hilaree Nelson and Conrad Anker; Coffee & Conversations touching on subjects like immigration policy, dark money and the #metoo movement; Sunday’s Reading Frenzy at Hotel Madeline and a slate of outdoor-based Free-Range Programs that include hiking with skier Caroline Gleich and interacting with rescued wolves. Beraza says one free event she’s especially excited to share is the retrospective program, which will fill the Wilkinson Public Library all weekend with best-loved festival films from Mountainfilm’s vault. Mountainfilm staff interviewed former employees and researched old programs to come up with the best of the festival’s past. These archival films include everything from Oscar-winning features such as Born into Brothels to hilarious shorts like The Lost People of Mountain Village and epic archival adventure films like Fitz Roy, the 1968 climbing film that was the marquee film at Mountainfilm’s very first festival. “You could spend all weekend [at the library] and have a great festival,” Beraza said. Passholders will be admitted to these screenings first; the public will then be let in. 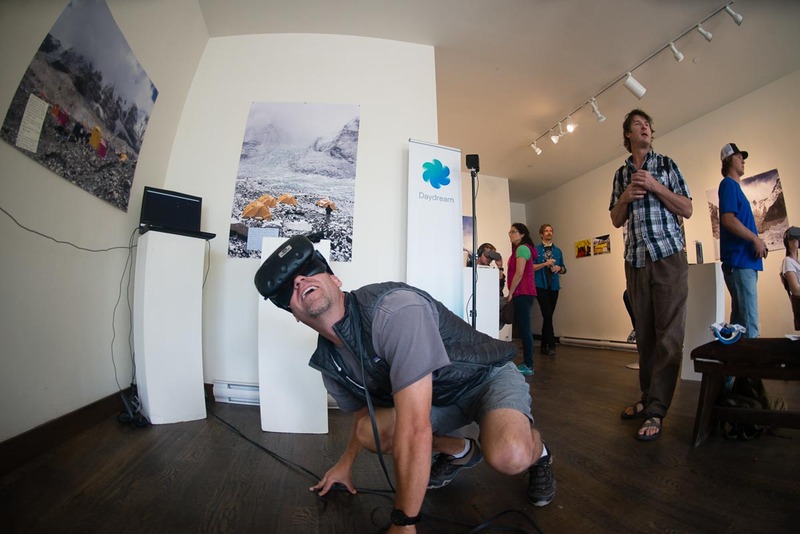 Another option for free films is Mountainfilm’s Virtual Reality Studio, which will be open from 9 a.m. to 5 p.m. Saturday in the Sheridan’s SHOW Bar. Mountainfilm has again partnered with Google to curate a number of immersive 3D experiences for its audience. This year’s batch includes stories about food waste in the fishing industry, responsible gold mining in the Congo and America’s diminishing quiet places. While virtual reality is still a relatively new platform, Beraza says, “it definitely now has a strong foothold, and we really want to support films that have messages that are in line with Mountainfilm’s mission. And finally, Mountainfilm is throwing a huge community party to celebrate its landmark anniversary. The 40th Bash, which takes place Saturday from 7-10 p.m. in Heritage Plaza in Mountain Village, will include music by DJ Kat V, libations and dancing.